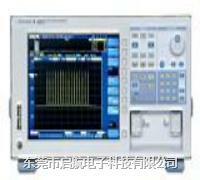 收购/销售 AQ6330 光谱分析仪 AQ6331 AQ6330 is like no other optical spectrum analyzer you have ever seen. It is compact, lightweight - very portable. AQ6330 is like no other optical spectrum analyzer you have ever seen. It is compact, lightweight - very portable. It weighs only 8 kg (18 lbs. ), yet has all the features you need from a WDM system for field use. Compact and lightweight:Approx. 300 (W) x 200 (H) x 220 (D) mm, approx. 8 kg (18 lbs.). High wavelength accuracy: Accurate to within ±0.05 nm for wavelength from 1500 to 1570, ±0.02 nm linearity, within a 1550 nm range. High-level accuracy: High accuracy: ±0.3dB.